Its time for you, the people of the Tri-Cities to vote the best in Brewing this year! ^ questions and you have all the answers! So tell your friends and vote! Results in the new year! 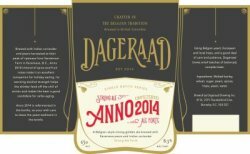 Man is it cool that the Vancouver Beer community has gotten to a point where we can support a style brewer like Dageraad? The best part is we are rewarded with for it with great belgian beers, and Anno 2014 a Belgian Golden Ale is another great seasonal. From the pour into the glass you are treated to a beautiful looking beer with a golden translucent hue. Champagney aroma abounds from the high carbonation, while the beer drinks sweetly with a crisp fruit finish with the Keremeos pear apparent yet not overbearing. Be careful when pouring as this beer does bottle ferment, while also being careful not to let the 8.3% ABV sneak up on you! Get one soon this could be Dageraad’s best yet!